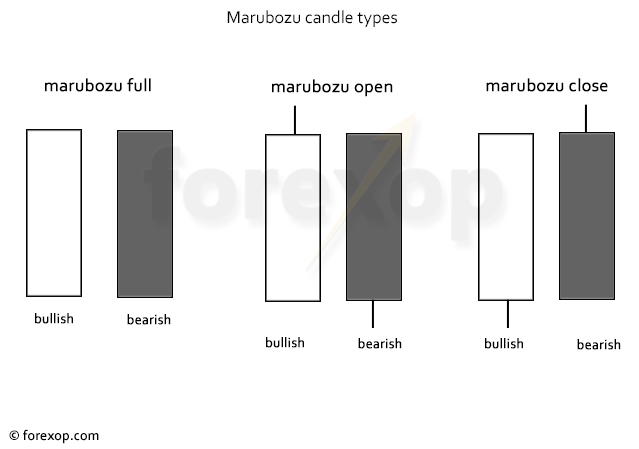 A marubozu is a single candlestick pattern that can give some insight into market sentiment at a given time. Its appearance basically means that the market traded to the close without any retracement. With a bearish marubozu, it means the price closed at the period low. With a bullish candle the price closes at the period high. Because a marubozu is just a single candlestick it is fairly easy to identify. It does come in a few different shades which we’ll look at separately below. A full marubozu is just a long candlestick with no upper or lower shadow. It consists of a bar with a flat top and bottom line. It can be either bearish or bullish. For a bullish signal the open and the low are at the same price and the close and the high are at the same price. For a bearish signal it’s the other way around. The open price and the high are the same and the close price and the low are the same. The two variations of the pattern are the opening marubozu and the closing marubozu. Again these can be either bullish or bearish. In a bullish open, the open price matches the low. In a bearish open, the open price and high are the same. With a bullish close, the high matches the close. And with a bearish close, the low matches the close. See Figure 1. The easiest way to remember these is that the marubozu line is always flat. It’s either flat at the open or flat at the close. And for a full marubozu both the open and close lines are flat. Why is the Marubozu Significant? 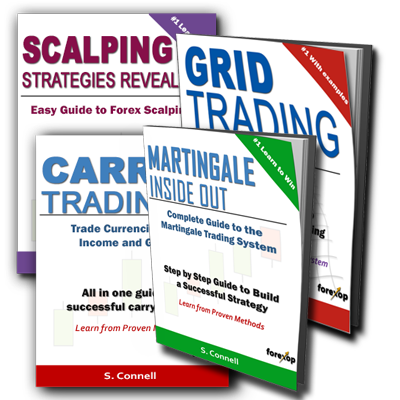 Chart traders are always looking for things that may give some clues to the market’s sentiment at a precise time. 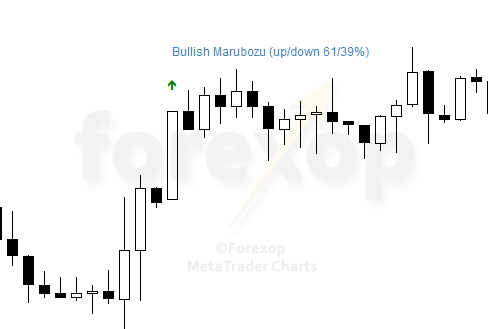 A marubozu candlestick gives specific insight into the buying and selling activity during the period it covers. Candlestick patterns such as the marubozu were originally used by stock traders. When a stock price closes at or very near the day’s high, this means that the market was bullish and remained that way until the close. This means that buying interest was strong enough that there wasn’t any price pullback or retracement during that time. A bearish marubozu means that selling interest was strong and that the market closed at or very near the day’s low. The market didn’t retrace back up to recover the falls. When we come across an opening marubozu, this only gives us partial information. With a bullish opening for example, it means that the price never fell below the opening price. But at the close there was some retracement. This can mean that the bullish sentiment started to decline and by the time of the close, the market was losing some upwards drive. This results in a retracement and it’s this retracement that produces an upper shadow line on the candlestick. With a bearish opening marubozu it is merely the opposite picture. These patterns are similar in appearance to belt holds. In practice a closing is of more interest than an opening because it tells us about the price activity at a later point; the time of the close. The close or open here means the close and open time of the chart bar. This doesn’t necessarily correspond with the opening or closing of the market itself. 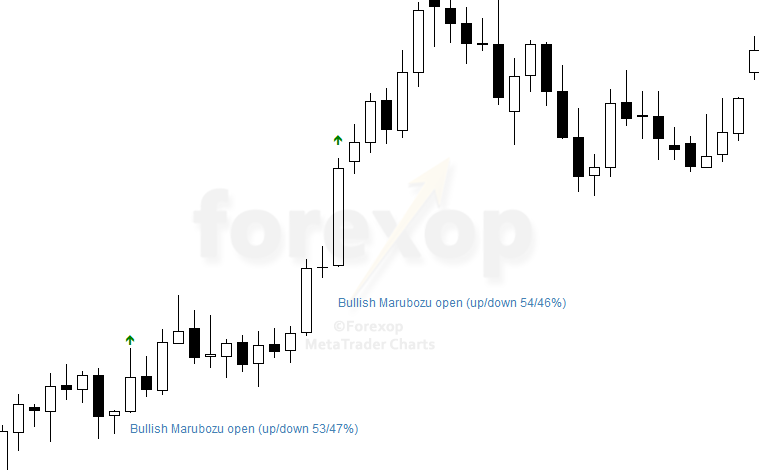 Like an opening, a closing marubozu can either be bullish or bearish. With the bullish closing, the price closes at the period high. With a daily chart this means that the price closed at the high for the day. For a bearish closing, it means the price closed at the lowest level. Meaning there was no upwards retracement of the price from the low line. How Reliable is the Marubozu? The marubozu certainly can be a useful trading signal owing to its simplicity and its easy interpretation. Like any chart tool, it is imperfect. The predictive ability is not fixed but varies significantly across charts and at different times. So what works at one time may not work the next. That means when trading the pattern we have to look at a range of different elements. This includes the directional breakout probabilities for the pattern on the chart in question, as well as the existence of other signals like trends, supports and resistance areas. 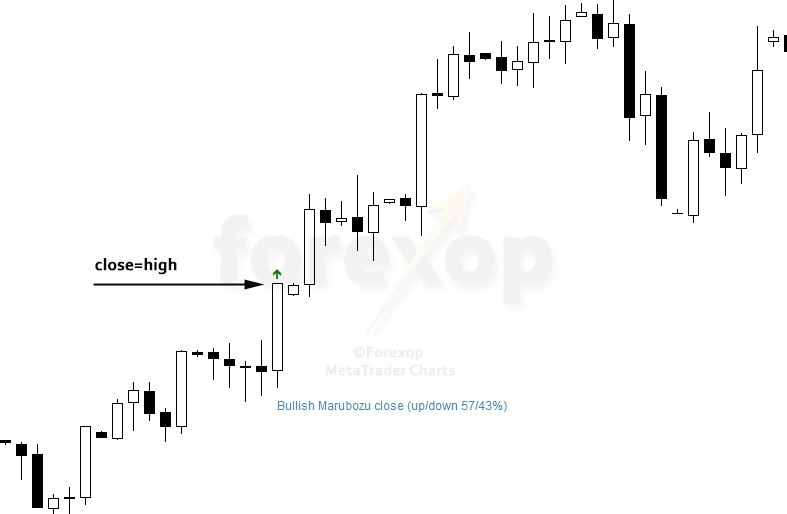 Marubozu’s candlestick pattern can certainly be an awesome trading signal tool, because conceiving data and reaching to certain result is not difficult at all using it. Though, there is much work needed in order to improve predictive ability, yet this tool is perfect for beginners.